Pat Bailey was named Oregon State's interim head coach on Sept. 6, 2018. Bailey completed his 11th season with the program in 2018. Bailey joined the program as an assistant coach prior to the 2008 season, and has helped guide Oregon State to an NCAA postseason berth in seven of his nine seasons. • Oregon State has reached the 50-win plateau three times with Bailey on staff, including 55 in the 2018 National Championship season. • Bailey, who oversees the team’s outfielders, has seen nine different players named All-Pac-12 First Team, including Michael Conforto, Dylan Davis and Jeff Hendrix, who were all honored at least twice during their careers. In 2017, Jack Anderson was recognized, followed by Trevor Larnach and Streven Kwan in 2018. • Both Larnach (first round) and Kwan (fifth round) were selected in the 2018 MLB Draft. • Conforto became the first Oregon State player to be named Pac-12 Player of the Year in back-to-back seasons, in 2013 and 2014. In 2012, his first season in Corvallis, Conforto was named the Pac-12’s Freshman of the Year. • Conforto was drafted in the first round of the 2014 MLB Draft and advanced to the New York Mets’ MLB roster in his first full season in the pros. He also became one of the youngest players to hit a home run in a World Series game. • Conforto, along with Hendrix, were named All-America during their tenure at Oregon State. Conforto was the first true freshman in Oregon State history to be named an All-American. • In 2014, Conforto, Davis and Hendrix were all named to the Pac-12 First Team. No other team had its entire outfield named first team in more than a decade. • Daniel Robertson played in Bailey’s outfield as a senior transfer in 2008. He was drafted in the 33rd round of the draft that season and has since seen action at the MLB level with the Texas Rangers, Seattle Mariners and Los Angeles Angels of Anaheim. Bailey came to Oregon State prior to the 2008 season after spending 12 seasons at George Fox, winning a Division III national title with the Bruins in 2004. Bailey compiled a 353-158 record - and is the winningest coach in school history - and earned National Coach of the Year honors after that 2004 national title. He was an eight-time Northwest Conference Coach of the Year honoree. During Bailey’s tenure, the Bruins won or shared eight Northwest Conference titles. George Fox advanced to the NCAA tournament six times and to the NAIA playoffs twice before moving to the NCAA. Bailey is the winningest baseball coach in the school’s history. In 2004, Bailey’s team became the first George Fox squad in any sport to win an NCAA national championship. The Bruins went 40-10 overall, setting a new single-season record for wins and tying the record for best winning percentage at .800. After tying for the 2004 NWC title, George Fox earned an at-large bid to the NCAA tournament. The Bruins swept through four games at the NCAA West Regional in Orange, Calif., and then posted a 5-1 record at the Division III World Series in Appleton, Wis., beating Eastern Connecticut State 6-3 in the championship game. Seven of Bailey’s George Fox players signed professional contracts, including five members of the national championship team. His players earned 10 All-America honors and four Academic All-America honors. Bailey earned his business education degree from the University of Idaho in 1978 and his master of education degree in educational administration from Oregon in 1983. Bailey earned two letters in baseball at Idaho and was the team captain. Bailey graduated in 1974 from Moscow (Idaho) High School, where he played football, basketball and baseball, being named the baseball team’s Most Valuable Player. Bailey and his wife, Susan, have two children: son Alex, who played baseball for George Fox in 2003, and is married to Lucy; and daughter Ann. His daughter, Ann, is married to Collin Schneider and they have two children, Adlai and Evey. They are the owners of the Tried and True Coffee Shop in Corvallis. Nate Yeskie, the 2017 Assistant Coach of the Year by D1Baseball.com and the Pitching Coach of the Year per Collegiate Baseball, completed his 10th season with the program in 2018, helping the team to its third national championship. Yeskie has presided over and guided a pitching staff that has been one of the most dominant in the Pac-12 Conference and nationally since he joined the Oregon State program in 2009. • In 2018, he mentored Luke Heimlich, who was named the National Pitcher of the Year, and Kevin Abel, who was named the Freshman of the Year. Heimlich led the nation with 16 wins and was second with 159 strikeouts. Abel went 8-1 with a 2.88 ERA and became the first pitcher to ever win four games at the College World Series. • As a team, the Beavers posted a 3.27 ERA in 2018, good for 12th nationally, and 596 strikeouts, which set a single-season record at Orgeon State. The staff posted eight shutouts, which led the Pac-12 and third nationally. • Oregon State set a school-record with a 1.93 earned run average in 2017, which also led the nation. The Beavers were also tops nationally in shutouts (14), hits per nine innings (6.27) and WHIP (0.98). • Nine different pitchers have been named All-Americans during his tenure, including eight since the 2013 season. Most recently, in 2018, Luke Heimlich, Bryce Fehmel and Jake Mulholland were all named All-Americans by at least one publication. • Oregon State pitchers have been named Freshman All-Americans 10 times, including Mulholland and Brandon Eisert in 2017. • The Beavers have tossed 85 shutouts since 2009, an average of better than eight per season. • He was named to the nation’s top pitching coach by Collegiate Baseball after the 2013 season. His staff posted a 2.28 ERA and 12 shutouts in helping the Beavers to a school-record 52 wins and a berth in the College World Series. • Oregon State’s pitchers have been drafted a total of 28 times during his tenure, with 16 coming in the top nine rounds. • Five of those drafted, Matt Boyd, Josh Osich, Jace Fry, Andrew Moore and Sam Gaviglio have pitched at the Major League level. • Oregon State has appeared in the postseason in nine of his 10 seasons as pitching coach. • In 2014, Jace Fry threw a no-hitter for the Beavers, one of three under Yeskie. Most recently, in 2015, Drew Rasmussen threw the first perfect game in Oregon State’s history, defeating Washington State. In 2010, Osich out-dueled fellow future Major Leaguer Trevor Bauer in a no-hitter at UCLA. • Oregon State shut out UCLA to end the 2016 season, the first time in school history the Beavers shut out the same team in three consecutive games. • Four pitchers have pitched for Team USA during his tenure: Moore, Rasmussen, Boyd and Dan Child. Yeskie served as the pitching coach at his alma mater, UNLV, from 2005 to 2007. During his tenure with the Runnin’ Rebels, Yeskie mentored eight players who earned either an All-Conference or All-Tournament Team selection. Prior to returning to UNLV as a coach, Yeskie spent five seasons in the Minnesota Twins Minor League system, reaching as high as Double-A New Britain. He finished with a 27-24 record and 4.91 earned run average over the five seasons. Yeskie went 11-7 with Fort Wayne of the Midwest League in 1997, recording 111 strikeouts in 165 1/3 innings of work. In 2000, his last season, the La Crosse, Wis., native went 4-1 in 21 appearances. During his time in professional baseball, Yeskie worked with MLB veterans Bert Blyleven, Mel Stottlemyre, Jr., and former pitching coach Billy Connors, who once held the position of Director of Player Personnel with the New York Yankees. Yeskie came to the Twins organization after being drafted in the ninth round of the 1996 Major League Baseball First-Year Player Draft. Minnesota selected the right-hander after he finished his UNLV career with a 22-12 mark, including 16 complete games. A three-year letterwinner, his 147 strikeouts in 1995 still stand as UNLV’s single-season record. The mark was also fifth-best nationally that season, and coupled with his nine complete games – which led the Big West Conference – earned him First-Team All-Big West and First-Team All-Region honors. Yeskie married the former Brittney Belshe, a former Oregon State volleyball player, in January 2012. The couple resides in Corvallis, and have a daughter, AJ. 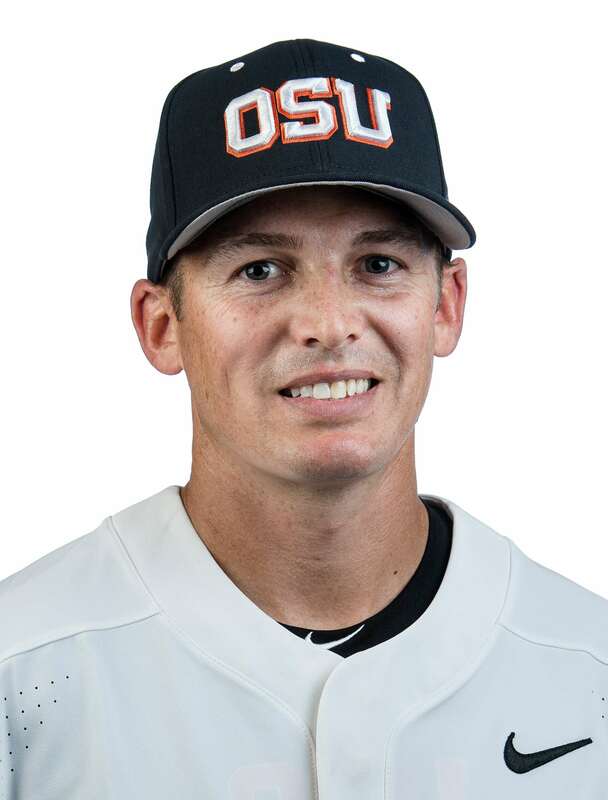 Former Oregon State infielder Andy Jenkins completed his sixth season on the Oregon State staff as an assistant coach with the Beavers in 2018. He helped guide the program to its third national championship. Jenkins played two seasons at Oregon State under head coach Pat Casey, helping guide the Beavers to the 2005 College World Series. He played professional baseball for the Florida Marlins and Texas Rangers organizations before returning to Corvallis as an undergraduate assistant coach in 2012. • Cadyn Grenier was named the Pac-12’s Defensive Player of the Year in 2018, giving the Beavers three straight, following Logan Ice (2016) and Nick Madrigal (2017). Madrigal, Grenier and catcher Adley Rutschman were all named First-Team Pac-12 and earned All-American honors. Grenier was also named the Brooks Wallace Award recipient as the nation’s top shortstop. • Jenkins, who oversees the team’s infield and catchers, saw three of the team’s infielders named Pac-12 First Team in 2017 - Nick Madrigal, KJ Harrison and Cadyn Grenier. Madrigal was named the Pac-12 Player of the Year and its Defensive Player of the Year. Madrigal is just the second player in the conference to earn both honors in the same year over the last two decades. • Two Oregon State players under Jenkins’ tutelage - Logan Ice and Nick Madrigal - earned major Pac-12 Conference honors in 2016. Ice was named the Defensive Player of the Year, while Madrigal was named the Freshman of the Year. • Madrigal’s selection gave the Beavers two consecutive Freshman of the Year honors as he joined KJ Harrison, who won it in 2015. • Ice was named a finalist for the Johnny Bench Award in 2016. The honor is given annually to the nation’s top collegiate catcher. Rutschman was named a semifinalist in 2018. • Ice was charged with just one passed ball in 2016, and threw out nearly 45 percent of basestealers attempting against him. • Oregon State’s catchers have thrown out at least 50 percent of opposing basestealers in four of Jenkins’ six seasons as an assistant coach. The Beavers are the only team in the Pac-12 Conference who have accomplished that feat. • The Beavers have allowed only 127 stolen bases over that stretch, an average of less than 22 per season. They’ve thrown out 139 - an average of nearly 24 a season - for a 52.2 percentage. • Oregon State’s fielding percentage has been at .972 or better in each of Jenkins’ six seasons. The 2014 Beavers finished with a school-record mark of .979, which was equaled by the 2018 team, which lead the Pac-12 with 52 double plays. • Since 2013, the Beavers have also turned 293 double plays, one of the top totals in the Pac-12. • In the past four seasons, since 2014, OSU has committed just 24 passed balls. Ice, the team’s starter for three years during that stretch, was charged with only four. • Ice, who was a second-round selection by Cleveland in the 2016 MLB Draft, ended his Oregon State career with a .996 fielding percentage and threw out 49-of-101 (48.5 percent) of opposing basestealers. Jenkins lettered for the Beavers in 2004 and 2005, helping guide the team to its first visit to the College World Series in more than 50 years his junior season. Jenkins, a native of Salem, Ore., was also the most prolific Beaver offensively during the team’s postseason run. He batted .459 - leading the team by more than 100 points - and tallied two home runs, two doubles and 13 RBI while slugging .784. His .388 average as a senior in 2005 still stands as the ninth-best figure in team history. He also had 56 runs batted in that season, which led the club and stands as the 10th-best mark in a season in school history. He ended his two-year Oregon State career having played in 98 games, batting .343 with 12 home runs, 15 doubles, 86 RBI and 41 walks while striking out just 44 in more than 340 at bats. His .343 career average is just shy of being in the top 10 for a career at Oregon State. After his Oregon State career, Jenkins was selected in the 11th round of the 2005 MLB First-Year Player Draft by Florida. He played six seasons in the Minor Leagues with Florida and Texas, reaching the Triple-A level in 2009 and 2010. His six-year career saw him tally 2,341 plate appearances and he batted .268 with 32 home runs, 116 doubles, eight triples and 277 RBI. Jenkins came to Oregon State after a two-year career at Mt. Hood Community College where he batted .358 as a sophomore, and as a freshman, was named first-team all-league at catcher. Jenkins graduated from Oregon State with a degree in psychology in 2012. He is a native of Salem, Ore., and married the former Jessica McGee in January 2013. The couple have one daughter, Blakely Drew Jenkins. Gipson comes to Oregon State after four seasons as the head coach at Linn-Benton Community College, where, in 2018, he led the Roadrunners to a 42-4 overall record and 29-1 mark in conference play. LBCC was 119-58 (.672) in his four seasons as head coach, including a 72-16 (.818) mark the past two years. "I'm excited to have Ryan Gipson be a part of our coaching staff," Bailey said. "He is a great teacher and has a really good baseball mind. Obviously, the success he had so quickly at Linn-Benton Community College is a testament to how hard of a worker he is. "More importantly, he is a great human being and I'm glad Ryan is on our staff." Gipson lettered for the Beavers in 2005 and 2006, helping guide Oregon State to back-to-back trips to Omaha, including a national championship. He played in 79 career games, starting 66, and batted .270 with 10 doubles, a home run and 36 runs batted in. In 2005, he led the then-Pac-10 with a .500 on-base percentage. A Central Point, Ore., native, he played for Shasta Community College prior to his career at Oregon State. He hit .358 as a sophomore and .344 as a freshman. Gipson served as an undergraduate coach for Oregon State in 2011 and 2012, then spent two seasons as an assistant coach at Dixie State in Utah. He graduated from Oregon State in 2006 with a bachelors of science in sociology.